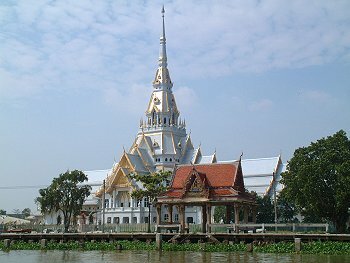 This pagoda is situated on the west bank of the Bang Pakong River, 2km south of the city hall. Enshrined in a new gigantic hall is Phra Phutthasothon, or "Luang Pho Sothon" regarded as one of the most revered Buddha images in Thailand. The image, in the attitude of meditation, measuring 1.65 m wide at the lap and 1.98 m high, is always seen entirely pasted with gold leaves by worshipers.